In this fourth season of excavations on Petersfield Heath two of the three sites excavated had points of particular interest. The most exciting find is a presumed burial urn found under Barrow 8 close to its centre. 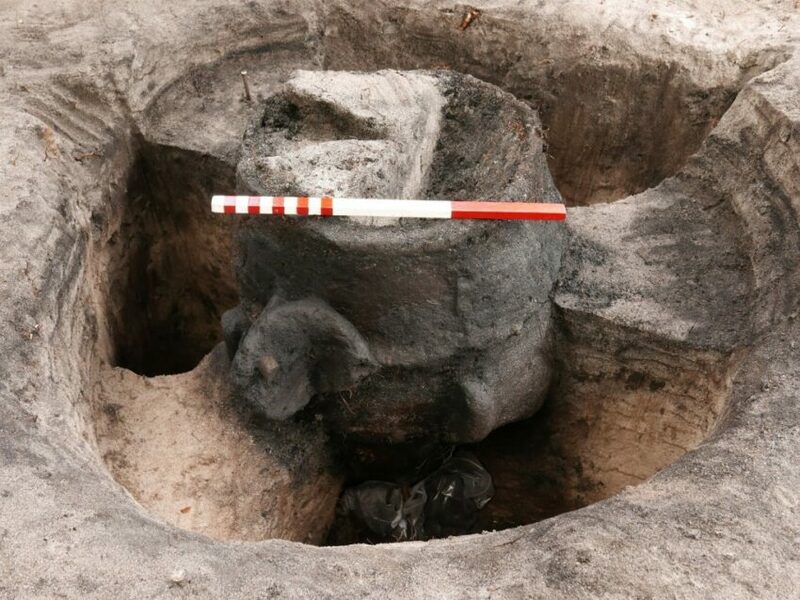 The urn was placed in a tightly fitting pit, and the archaeologists and volunteers had to painstakingly excavate it and lift it complete with its contents for laboratory micro-excavation. Its full story will only be revealed over the coming months, but it is already clear that it is a Collared Urn, a ceramic type dating roughly to 2000 – 1500 BC. Collared Urn burials are not uncommon in the Early Bronze Age, but the Barrow 8 example seems to have associated organic objects. These could be further rare and significant finds to add to the mineral-replaced wooden handle from Barrow 13 and the half tree-trunk from Site 24. See the latest Project report.